Privakey, the leader in secure customer engagement, is pleased to announce the latest version of its Privakey CX solution. Privakey CX is a licensable technology that delivers a new channel to securely interact with customers within the mobile apps they already enjoy on their phones. Built on the foundations of multi-factor authentication, Privakey extends the security principles of MFA to any user interaction that requires strong identity confirmation, approval or consent. An example of Privakey’s value is demonstrated with the rapidly growing smart speaker market. Such devices, like Amazon Alexa and Google Home, have an inherent challenge with user identity that limits customer interactions across health, financial services, and other sensitive markets. Privakey expands what’s possible for voice developers to build by assuring the identity of the user interacting with the device. Learn more about Privakey’s voice solution here. In the example you see to the left, a bank has embedded Privakey’s technology in its mobile banking app in order to allow higher value transactions initiated via voice. 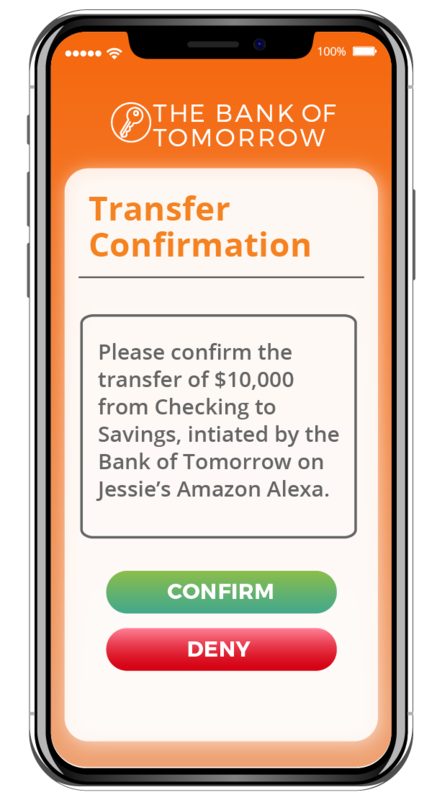 Once the transfer is initiated, a secure push notification is sent to the customer with details of the transaction. After review of the details, the customer confirms the money transfer and identity with their device biometric. This same technology can be used to simplify call center identity, to approve workflows, and to consent to anything. The latest version of Privakey CX is written in Node JS for rapid implementation in any environment. Privakey CX delivers its technology through SDKs for iOS and Android as well as a white labeled app for rapid deployment. Privakey CX connects to any service via a simple restful API that can be deployed on-premise or as a hosted solution. Please contact us at hello@privakey.com to request a free trial or demo of our technology.